Note: All product outward appearance, the color take the material object as the picture only supply the reference. 2.FAT32 is factory default drive format, which is read/write compatible with Windows and Mac OS; while NTFS is compatible with Windows but semi-compatible with Mac OS. Please format it properly if need. Thank you for choosing RAOYI products. If you are not happy with our products, please do not hesitate to contact us. In every customer relationship, RAOYI strives to be a trusted partner and seeks to achieve 100% customer satisfaction. 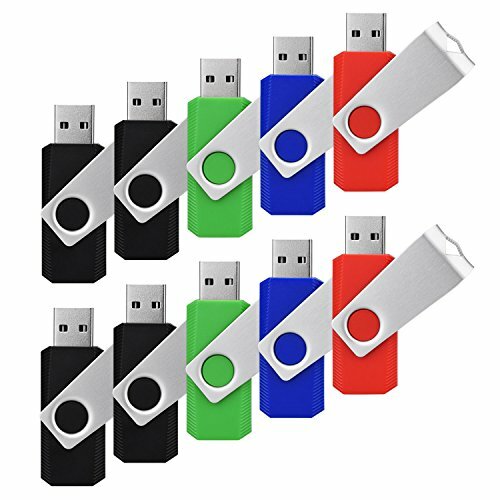 USB 2.0 Interface: No need to install any software, just simple plug into the USB port of computer or other devices and use it!Allows you to connect your Windows 10, 8, 7, Vista, XP or 2000,Mac OS X,Linux 2.6x computer. No drives are necessary,just plug it in. Swivel Cap Design: The metal clip rotates 360° round the ABS plastic body which with rubber oil skin feeling finish. A cap that you can't lost.With keychain hoop, you can connect the thumb drive to your keychain. LED Indicator: The Led activity indicator at the end of the flash pen drive lights up to let you know when the memory jump drive is active.suitable for storing digital data for school, business or daily usage.The digital data includes music,video,photos,movies,manuals,software,etc. 10PCS Great Bundle: 1 year warranty.Allows you to organize your files and ensures you always have a backup. Also share with your students,colleagues,friends and family. If you have any questions about this product by RAOYI, contact us by completing and submitting the form below. If you are looking for a specif part number, please include it with your message.